Chicago native Dodie Morris has appeared as soloist with orchestras and choruses throughout the Midwest. Recent performances include Bach’s B Minor Mass and Cantata No. 51, Haydn’s Lord Nelson Mass and Beethoven’s Choral Fantasie. The Chicago Tribune applauds her “stylish, joyous…expressive spark;” her diverse career has led her from Symphony Center to Carnegie Hall and the stages of the Chicago and Boston Lyric Operas, performances with the Joffrey Ballet and numerous television appearances and recordings. Formerly a member of Chicago a cappella, the Oriana Singers and His Majestie’s Clerkes, she has been engaged full-time with both the Chicago Symphony Chorus and Music of the Baroque since 1996. Ms.Whitaker is a powerhouse with a soulful and breathtaking soprano. She masterfully accomplishes technical perfection with vivid and thoughtful performance. She received her Bachelor of Music from Oberlin College Conservatory and Master of Music from New England Conservatory, and currently teaches voice at Youth Initiative High School in Viroqua, WI where she also leads a series of vocal workshops throughout the year. Thank you for taking time out of your intense schedule. I’d love to start with you telling me about playing your favorite role? That’s a great question…I haven’t ever gotten to play the roles I thought I would play. I’ve played the roles that were available and that were in my voice part, I’ve enjoyed them. I almost played Despina in Cosi Fan Tutte Mozart, but then it got cancelled. Another favorite role of mine is Mabel in ThePirates of Penzance. What’s interesting is, what makes a role enjoyable is the overall experience of it: who I am performing with and the circumstances of the production. I’ve done a lot of Gilbert and Sullivan and the role that I remember best is Phyllis in Iolanthe, because the character fit my personality, the part fit my voice, and all of my friends were in it with me, and my sister was in it, which made the entire experience fun. That’s probably what makes it one of my favorite roles. I also had the opportunity to play Harriet Tubman in a short opera with a bunch of high school students as the chorus. I really enjoyed that because working with the students was energizing, just to be with them and to act as if I were leading them to freedom. Being a part of their experience. It was a small choir from Curie High School on the south side of Chicago, and what the opera meant in their lives – that made the part one of my favorite roles.The biggest part I ever played was my fifth year in college in a Salieri opera no one’s ever heard of, First The Music, Then The Words. I played an actress named Tonina who was a singer, so I got to be a “crazy soprano”, and it was fun to play an over the top version of myself. The biggest lessons I have learned, as a singer who is training, is you have to keep your mind open; it’s not what you’d expect. When an opera comes up, and someone is doing it, you may never have heard of it, you may never have imagined what you would do. You have to throw out all the ideas of what a classic role is in your mind and be open to anything. I played a boy once in a Kurt Weil opera. It wasn’t the role I would’ve expected to play when I was at conservatory, but I played the lead, and it was a great experience. What has been the most challenging singing role for you as a vocalist? The most vocally challenging thing for me to sing are not really roles, but in early baroque music, where the soprano parts are the most challenging. In terms of roles, the smaller the role, the harder it is to play. I had lots of roles where I was on stage the whole time but I had to find a way to be engaged on stage and react and be involved and without being able to sing. One role that was difficult was the wife Elvira in The Italian Girl In Algiers. I had to sing high Cs repeatedly, which was challenging. I had to be in such good voice every night. I had to really take care of myself. It was a great role. I was in graduate school, too. I went to bed early, drank lots of water, tried not to talk too much during the day, saved carousing until the closing night party. Nowadays, I don’t go anywhere without a water bottle, but I was not like that at the time. I was more resilient. If I were my student (some of my friends had teachers that were so hard on them), I would definitely say not to smoke. I know a few basses and altos who smoke, but I don’t know any sopranos who do. Smoking, alcohol, talking too much, lack of sleep – all affect the voice. If you’re playing a challenging role, you have to stay away from all of it. 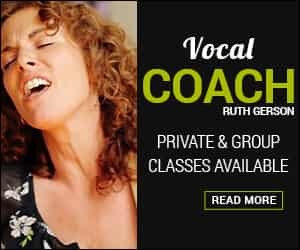 How much time do you recommend a serious voice student practice? That’s a tough one, because you don’t want to practice too much, because of the wear and tear on your voice. A pianist will practice four to eight hours a day. A singer can’t do that.I would spend a few hours every day, not just singing, but learning music, plunking out notes. Sing twenty-five minutes, take a break, stay in the practice room, stay on the music, rest the voice, and then go back and practice in full voice again. It depends on the day. If you have a lot of singing to do that night, you don’t want to spend three hours practicing in full voice. Talking is the biggest issue. I don’t see how people teach all day and sing. You have to be really cognizant of how you’re using your speaking voice. Speak high and off the chords or you’re in trouble. I have found that by the ninth or tenth hour of teaching, my voice will start to show signs of giving out, but generally I’m okay if I stay in a normal speaking voice, but keep my breath support constant, so that I’m never forcing the voice when I speak. I am constantly expanded, so I am never pushing. But, it’s true as a singing teacher and a performer, there are times when the very top and bottom of my range can be compromised from those back-breaking days. If I have important shows coming up, I have to keep the teaching schedule reasonable…I like what you said about practicing, that for the singer, it’s two-fold, it’s the instrument itself, but also learning the music. What people don’t understand about the voice – there’s the technical element, your vocal warm-ups and breathing exercises, you practice coloratura, mezza di voce, and that is something that really needs to be practiced, that’s half. The other half is of learning repertoire, it has to get into your voice. You can’t just sing a song and have it be the way you’d like even if your technique is perfect, because each song, each aria, is going to fit differently in each voice, every body has a different voice. It can take a long time to get the music into your memory and in your voice. What would you consider the best way to practice singing? If you have a limited amount of time, even a few sighs up in the head, getting your palate up, that’s something you don’t do when you’re talking, breathing exercises, several vocal warm-ups to get your throat open to get in singing mode, make all the difference. Yawning in the back, putting the voice in the right place in your mouth, lifting the palette and singing from the diaphragm. If you don’t do those to things, you can’t sing classical music, because there’s no way the sound is going to resonate. What else do you recommend for vocal health? What are you vocal health secrets? Besides water and vitamin c, slippery elm… Singers Saving Grace Spray, San Spray, Echinacea and goldenseal. Old time opera greats, they would swear by a shot [of liquor, brandy, cognac], that it would open up the voice; maybe it helped them not get nervous. Yes, I know, but the problem with drinking alcohol when you sing is that you lose sensation and can accidentally hurt yourself, because you don’t exactly feel everything that’s going on. That’s the thing. If you’re in an intense situation when you’ve lost your voice, they give you cortisone, but you’re in danger of permanent damage and you can’t feel what you’re doing. May I ask a few technical questions? Sure. As you understand it, what is the correct position of the jaw? What is the correct mouth position for singing? I literally spread my fingers and put the hard part of my palms in the hollow of my cheeks. I guess I could get more technical, but the more you think about it that way, the easier it is. The hardest thing is to get people to open their mouths. Using a mirror helps. What is the correct position of the tongue while singing? I think I’ve had some tongue issues, you want it down behind the teeth, and scooped. Can you describe anything you’ve learned from a teacher that really improved your singing? e.g. how you support your voice, placement, position? What is your understanding about diaphragmatic breath support in singing? It took me a long, long time to figure that out. I always knew how to take a good breath, but managing it, parceling it out, so you’ve got enough so you’re not expending it all. 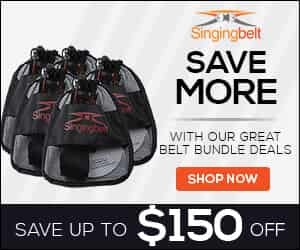 The Singingbelt is great because it gets you into the consciousness – there it is, you can’t ignore it. I didn’t understand before – I’d take these great breaths, and then I’d not have breath control, I’d let it go. Knowing how to manage the breath from the beginning of the phrase to the end is key. When I demonstrate breathing, I often use a visual, because for me it helps to feel like I can see what I’m doing. I think about pulling a string between my fingers, and really seeing the breath. I like that. Singing can seem mysterious because we’re manipulating something that’s invisible – air! So using visualization is a great tool. Yes, or I’ll make an arc with my arm – it’s all about phrasing, really. You have to know where to point the phrase – what’s the arc of the phrase, what’s the climax, what’s the end, often in foreign repertoire you have to decide where to breathe, you might be on the same word for three pages, you have to figure out how each page in broken down. This is part of getting the song in your voice. Any recommended reading for singers and for learning how to sing better? Richard Miller, The Structure of Singing. When I was at Oberlin, this book was highly recommended for technique. Also, A Soprano on Her Head by Eloise Ristad, which is a more creative and holistic look at performing. I recently moved to this vibrant small town in Wisconsin. People here are really supportive of the arts. I wanted to bring something that they didn’t necessarily have to the community. I have this vision of a room full of people just lifting their voices in harmony, a cappella, all kinds of music. So I invite people with or without singing experience to come and learn songs and sing together. We work a lot on repertoire, but also technique within the context of the songs, because a lot of people, especially in their later years, have concerns about healthy singing. It’s been really fun and I hope to continue and have the program grow.